This week we are playing detective (In special agent OSO style) and making secret messages with invisible ink. You can write messages or draw pictures to each other in secret ink and then make them appear to see what they say! 1. Squeeze out the lemon into a bowl. Add just 2/3 drops of water to dilute. (this is just to make it clearer on the paper!) Your invisible ink is now ready. 2. Take your invisible pen (your cotton bud) and dip into the ink. Write or draw your message. 4. When you want to reveal your message, you need to apply a heat source. Either hold it near a lamp, iron it or place in the oven. (I found the oven worked best). You do need to watch it carefully to ensure the paper does not scorch. Lemon juice is an organic substance that oxidizes (which means it reacts with oxygen) and turns brown when heated. 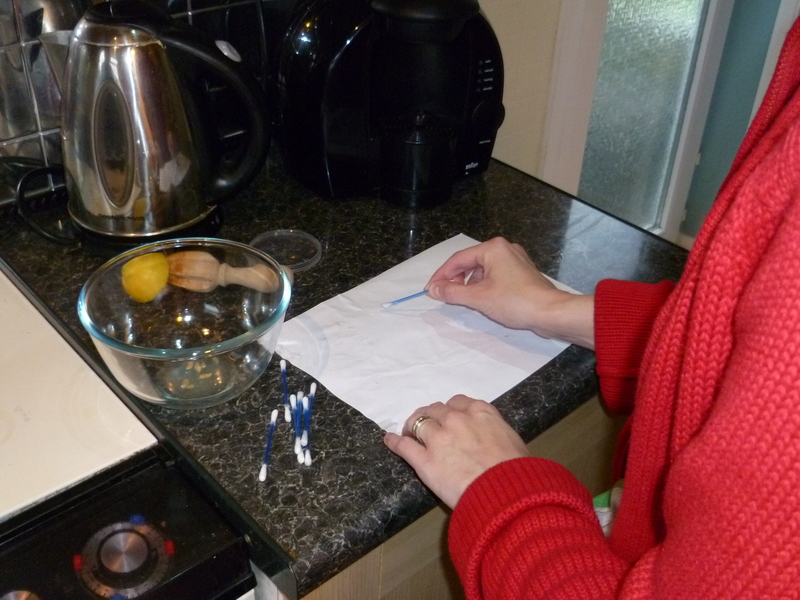 Diluting the lemon juice in water just makes it harder to notice the invisible message on the paper. The invisible ink burns faster than the paper so it turns brown first! Other substances which work in the same way include orange juice, honey, milk, onion juice, vinegar and wine. This is brill! My toddler is cutting down her nursery days from tomorrow so great to have some simple ideas for educational entertainment! Where does the hair dryer come in at, as a heat source to see or to just dry the paper?